After a successful photo tour our guests Neil and Brigitte Handy share their experiences. Detailed description of their bird photographic experiences can read on their website - http://handybirds.de/Bulgarien.html. You can read how they found the conditions for photographing birds in Bulgaria, what photo hides have used, what time of day is good for photography in different photo hides and many other useful bird photography information. For a few days they were able to photograph Bee-eaters, European rollers, Middle-spotted woodpecker, Golden oriole, Hawfinch, Green woodpecker, Red-baked shrike and many others interesting birds. Our guests from Germany Neil and Brigitte Handy are already at home and spend a lot of time to go over their images and post processing. 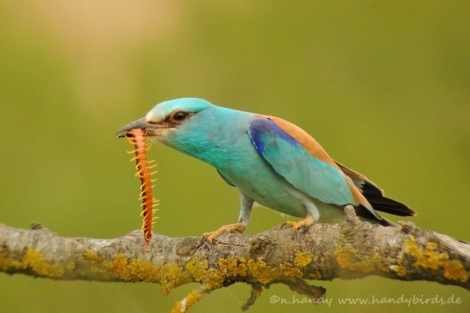 We are happy to show the results of their successful work and photos from their target species..
We are grateful to their help to popularize in Germany the photography of Rollers, Bee-eaters and Golden orioles in Bulgaria. Here are some words from theirs recomandations. Roller had just returned from migration. They were very active around the sand wall. Shortly after sunrise i put the hide and only after 15 minutes i captured first amazing shots. All the time they were very active hunted and landing on perches in front of the hide. If you want to photograph them, you must be fast, now is the time :)! Photography season started. 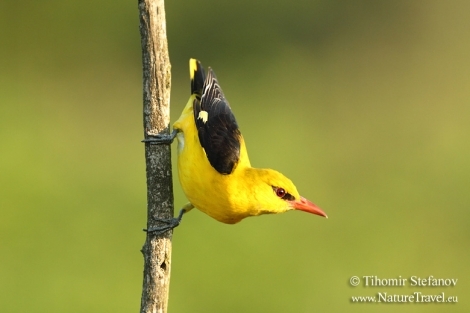 One of the interesting species that can photograph from the hides is a Golden oriole. Introducing a new article with some tips on how to make better photos of Oriole from our photo tower. Yesatrday we had incredible success with bird photography. 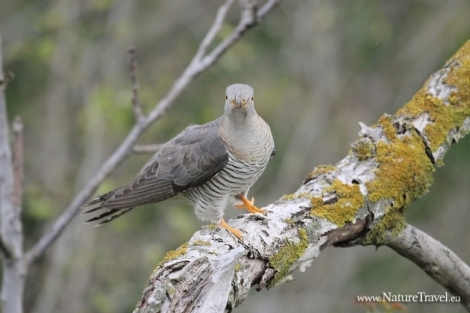 In early morning, about 7 o'clock photograph cuckoo. This amazing and clever bird perched on branch in front photo tower and stays long enough to make some incredible shots. Glad photographic season starts so well. This morning we observed also Syrian woodpecker, First golden oriole, Bee-eaters and Rollers.